Ear stretching: Is it permanent or can it go back? Ear stretching is one of the most popular forms of body modification performed today. Many parents are concerned about the implications of ear stretching and the possibility of irreversibility. Although many body piercings and stretchings are reversible (meaning they will re-close naturally upon jewelry removal), ear stretchings are not always reversible, requiring plastic surgery to repair. The question is; at what point does an ear stretching become permanent? Ear stretching is accomplished through the use of tapers, or stretchers, that are made of progressively larger sizes (gauges) inserted to the ear and forced in to create a hole that the body jewelry is then placed into. 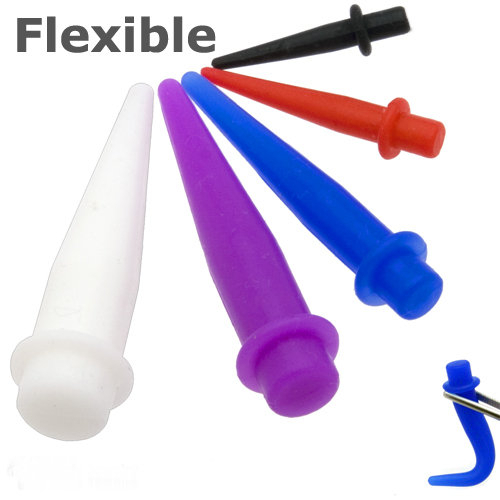 Ear stretchers, made of either plastic, steel, wood, stone, bone, or flexible materials like silicone, are available in sizes ranging from 16g to over one inch. The point where the ears will not return to their natural shape varies from person to person. However, it is generally agreed upon that for most individuals, an ear stretched beyond 00 gauge in size (10 millimeters) is irreversible. Another indication of irreversibility is the formation of a fistula. A fistula is the result of an ear being stretched too quickly and consists of scar tissue around the perimeter of the hole. If and ear does not return to it’s normal shape naturally, plastic surgery is required. « How do I know if my body piercing is infected?